Throughout our lives, we have been told to listen to our intuition, our inner voice, follow our gut, or follow our heart. However, the meaning of this advice might not always seem clear. We hurry to complete a task believing our inner voice has suddenly decided to expedite matters only to discover that was not the action for our highest good. We purchase tools, books, and/or spend money on classes believing we are listening to that inner wisdom only to discover ourselves to be further in debt. How do we know we’re listening to the “right” voice? In order to answer this question, we must first understand the difference between intuition and ego. As Sonya Shannon stated during her Transformational Oracle Workshop, “Ego is Edging God Out.” Now, you don’t have to follow a path to God to understand intuition or to access it, but that statement helps clarify the defining values of ego versus intuition. Ego is that protective force that helps us navigate life based on past experiences. How do we access intuition? Intuition is one of the highest forms of spiritual intelligence. For some, this may support a separation of psychic powers and intuition, but for others this may do more to solidify their connection. For me, I believe that guidance from our Spiritual Guides and our Higher Self may indeed come from within as well as from the “stars,” thus allowing intuition to stand on its own as well as being assimilated with psychic information—or rather to be used to access psychic information. The Mirrored Question Spread was created using an image I received after positing the question: What guidance do you have for me regarding my spiritual path? After receiving the image, I attempted to lay out the cards exactly in the shape shown. However, I began to question the image after realizing the question mark was reversed. Have you ever had the opportunity to bring something forward intuitively, question it, and then let it play out? For this examination into intuition, I did. First, however, I drew a question mark with my pen to make sure I was not mistaken, but then I researched reversed question marks. I found the word, “irony,” and knew that I should allow this to unfold so that I may better understand the need for a reversed question mark to answer my question. I connected with the Divine and asked for guidance as I chose and laid out each card. I found it interesting that 15 cards were laid out. In my understanding of numerology, 6 is a spiritual number and my question regarded my spiritual path. Each card was laid out facedown for two reasons: 1) to be able to take a picture as an example of the layout and 2) to uncover each step one-by-one. As I turned up each card, I asked the Divine to help me understand what each position represented. One may rightly ask if the card, itself, determined the representation or if the position was pre-determined as soon as the image of this spread was provided. Unfortunately, I do not have answer because it feels like both could be equally accurate. After moving through each card, I found it interesting that none of the fire cards were present despite the question pertaining to my spiritual path. However, as you read my interpretations of each card, it may seem quite obvious to you. It is also important to understand that I briefly meditated on each card to reveal the answer or understanding of how it related to that particular position. Since these cards were Divinely inspired through Sonya, it may seem appropriate that they do touch on the same elements provided in the guidebook and the workshop. We have the ability every moment of our lives to access and use our inner wisdom. Your inner wisdom is waiting! Whether you are a Medium, a Buddhist, a Christina, an Intuitive Reader, or just a “regular human” trying to navigate these tumultuous waters, we all have an access point. The only thing required is listening skills—the ability to quiet the mind and just listen. Give your EGO a task or ask it to sit in a corner and knit, play cards, or research the meaning of life. Take 3 deep cleansing breaths. Allow yourself to center releasing any doubts, issues of the day, or anything else racing through the mind. Continue to breathe paying attention to the in and out breaths. Feel free to count them if it helps. I find that 27 combined in/out breaths can be quite relaxing. When you are ready, set the intention to design a new spread. It might be helpful to have a question in mind, but it is not necessary. Pay attention to any images you receive, words, thoughts, feelings, and/or knowings. Do not be concerned with the title of the spread just yet—unless this information has already been received. If you receive an image of the spread or hear/know/feel the shape of the spread, it might be helpful to first draw this shape. Please feel to shuffle the deck and prepare to lay down each card. Listen for the number of cards that need to be presented. It might happen while you lay down each card (e.g. lay down until you get the feeling/hear/know to stop, or you may hear/see/feel/know a specific number. As you lay down each card (facedown), pay attention to the guidance you receive as to which position is number 1. For example, we may assume the bottom card has to be the first card, but it might actually be the middle top card. The reason for this will be evident as you work through the meanings of each position. 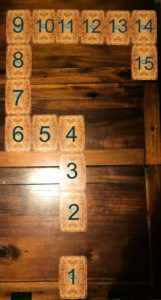 After you have laid down each card, please note the position and its number. It might be helpful to record each position after you have laid down the card (or right before) so that you will remember the “correct” order. The next step can either be done before turning over the cards or afterwards. It would be helpful to allow yourself to be guided to choose one or the other. Sometimes turning over the cards might also help you better understand the position and its meaning, but it may also hinder the ability to listen to your intuition. Do what feels right for you. For each card, meditate on the position and allow the meaning to intuitively flow. It would be helpful to write the words you hear and decipher them afterwards rather than to find meaning as the words flow. Once you have recorded each position and their meaning, return to the first position and began your interpretation. This particular reading may be used as an example for your intuitively designed spread. While keeping in mind the meaning of each position, interpret each card using any intuitive methods that feel comfortable for you. 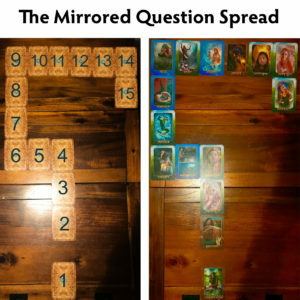 Since this is your spread, it may be helpful to look at each card separately and then summarize it rather than quickly looking at the spread and divining your answer. This will help you better understand—and trust—the guidance you received for each position. Lastly, type up or write out the spread—including the title—for future reference or to share with others. It may be helpful to include pictures (Appendix A). Congratulations on your new spread! Check out Adryanna’s Transformation Story!